Pottery mark query - Mueller and Circle Device:- Hi all, I picked this one up recently and I'm have in hard time finding the maker. It is marked on the base with a circle around the "ell"
Any thoughts would be most appreciated. There aren't many Muellers in the world of ceramics as far as I can see. There is a contemporary ceramic artist called Beth Mueller making quirky vases - but your piece doesn't much look like her style. There is a famous Ohio potter called Herman Mueller operating about 100 years ago who was mainly involved in tiles. If there were any association with Herman Mueller, your piece should possibly be in a museum. 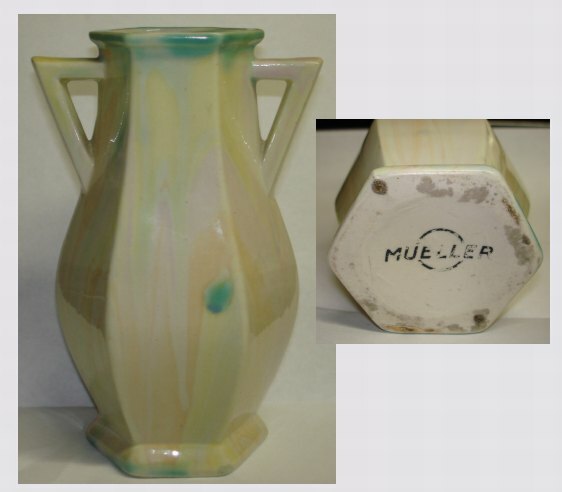 Thanks to contributor Lynne who has unearthed another ceramic maker called Mueller Co, based in Decatur Illinois, seemingly not associated with the company of Herman Mueller. See threads below for more information. few potteries using the more common Muller (or Müller). Herman C. Mueller set up the Mosaic Tile Co. of Zanesville, Ohio in 1909 which closed in 1938 (different sources quote different dates, so I don't know how accurate those exact dates are). Quite unremarkable you might say. Well, yes, apart from the fact that Mueller was helped to set up this company with one of the most renowned potters in American history, Karl Langenbeck. Langenbeck wrote the famous 'bible' of pottery chemistry written in 1895 (still available today) called "The Chemistry Of Pottery". Shortly after this time, Langenbeck became the driving force behind the early success of the world renown and highly collectible Rookwood Pottery of Cincinnati, Ohio (1880-1965). Langenbeck's first venture was the short-lived but glorious Avon Pottery of Cincinnati, Ohio. Avon wares are very rare and, actually are mostly in museums (high quality examples of ceramic art using the yellow Ohio clay with superb glazes). Somewhere in the mix Langenbeck took time to help J B Owen as chief chemist to the fledgling Owens Pottery Company c.1891 in Zanesville, Ohio. This company went on to become one of the most successful US ceramic companies of that era. So any association with Langenbeck is good for the value of wares. Obviously, the company Langenbeck set up with Herman Mueller was the Mosaic Tile Co - I don't know of any vases or decorative wares, but who knows? Did we ever get an answer on this? I have 2 of these vases shaped just like the one in the picture but a totally different color. They also have the Mueller with the circle in the middle marking. Anon, was the Mueller company your father worked for a ceramics place or the one in Decatur that makes fire hydrants? I finally found one that had sold on eBay recently. In the narrative about it they said it was made by the Mueller Co. in Decatur in the late 20's. They are still in business I think but make other things now. It sold for around $60. The 4 that I've seen (the one on eBay, one pictured here, and 2 that I own) are all shaped alike but just different colors. Hope that helps. Following the information picked up on this thread I have tried to find out as much as I can on Mueller Co of Decatur, Illinois. There is no information in the normal china makers guides, so I have just googled around and found as much as possible. There is very little online, so if anyone can fill in the gaps, we would all very much appreciate it. Apologies for any inaccuracies, please post if you can give any corrections, modifications or additions. The company was founded by a Hieronymous Mueller in 1857. It seems Mueller was not a potter, but an inventor and gunsmith, who had emigrated from Germany to the US. One source said he invented the water tap and spark plugs, but this would have to be researched further to get to the bottom of that. His sons were also inventors and made items as diverse as roller skates, sinks and soda fountains. Apparently, the company was responsible for designing weapons which helped in the WW2 effort. Tel: 1 217 423-616 (I am not US based, so it would be more difficult for me). What I want to know about is the pottery studio. I can find virtually no information on this. One report says the family funded a department called "Mueller Hall" at the University of Illinois which contained an art pottery studio. I don't know whether this was where the characteristic marbled vases were made. I read that the pottery output lasted only for about one or two decades, but I don't have any dates or details. I would love it if someone with inside knowledge could just write on this thread below (just click on the 'make a comment link' below). Interesting thread, thanks to all the contributions so far. I just got off the phone with a man who worked for the Mueller Co. in Decatur for 42 years. I too have one of these vases. The information about Mr. Mueller above is correct, being a German Immigrant. I am told that they used to make porcelain commodes, urinals, toilets etc. Mr. Mueller never threw anything away, and even years after his death, they would take any left over porcelain at the end of the day mix some colors in it and make these vases. The vases are all the same shape and are very art deco looking, made in the 1920's. They were given as gifts and not sold as they were not in mass production. Apparently the company got out of the porcelain work and began doing metal work. The man I spoke with started in 1959 and worked in the metal foundry. What a star you are!! Fascinating insight! These lovely vases were made from oddments of porcelain - what a fantastic story! I think these vases are a real part of US folklore and heritage and am glad we are featuring the story here properly. Being based in the UK, I find these vases interesting, exciting and very lovely - with a brilliant story behind them too. I wouldn't be surprised if they become collectible given time. After all, what collector of American fine china wouldn't be interested in having one or two of these in their collection? Plus, I have just Google-mapped Decatur and lo & behold, the next town along is none other than Springfield! Now that's more American than Mom's apple pie and white picket fences! I like these vases a lot. Thank you so much, Peter and Jennifer, for investigating and reporting! I live on the west side of Illinois and actually lived in Springfield for 15 years. I think it's time to take a little day trip to Decatur and look at the Mueller Museum there just to see if they have any displayed. If not, I guess it's on to Champaign to the U of I campus to see their display. It's such an interesting story. The ones I have were my grandmothers and since we have no ties in the Decatur area I can't imagine how she happened to have them but I guess that part will remain a mystery. When you do this trip, please write it up here in the comments section of your thread! Hope you enjoy your trip soon! p.s. You can write as many words as you like. I think there is a default number of words the system allows you, but if you run out of words, just do a 'continuation' on a new comments form. Thought I'd pass a little more information I learned about Mr. Mueller. He evidently did not like horses, so he decided to build automobiles. Between the end of the 1890's and beginning of 1900's he made three automobiles. He at some point spilled gas on himself and caught on fire and died. The Mueller Museum in Decatur found one of the cars in California several years ago owned by a 93 year old man. The man agreed to loan the car to the museum for 1 year, but somehow that changed and now the museum owns the car and has it displayed (from what I was told, I have not seen it). It sounds as if Mr. Mueller was a jack of all trades, from automobiles to porcelain to guns and ammo during the war to metal fittings and such. The man I spoke with said if I go to my water shut off valve in my front yard and look into the ground at some of the metal fittings I should find something marked Mueller Co. (I live in St. Louis). By the way Lynne, I was told the Museum is on Eldorado Street if you need a lead! The story is sad but interesting. What an amazing character! I do not normally touch on the value of items within the public forum on pottery marks as it is a specialist area which I cover in a different section here:- vintage and antique china values page....more. However, valuing these rare Mueller items is different and not so straightforward. It rather depends on how many were actually made and given away and how many remain. I don't think the general ceramic experts I work with could really get a handle on the value of these - this is more a specialist area. In one sense they are just ordinary molded vases made out of bits of old left-overs. In another sense they are a unique pieces of "Americana" or folk art representing the Art Deco era in the US as well as being a fascinating part of the history of one of the most interesting industrial companies ever to come out of the US. If as rare as we think they are, I think their value lies as museum pieces (and not just local interest as in the local Decatur museum) and if I were a folk art curator or an industrial museum curator, or a curator of Americana I would want to be showing the story of this company. For example, near where I live in Bath, England, there is an American Museum which would likely want to have an example of this type of Americana in their inventory. If anyone wants to do some further research in this area, please go ahead and then let us know here please. Hi I live in Decatur and have worked at Mueller co.for 20 so years. Your research on Mueller vase and MR. Mueller are pretty accurate The vases are end of the day vases and were used as salesmen samples to show buyers the color of porcelain. They also made two more styles and sizes that i am aware of. I have collected over time 7 small ones and one very rare large one. The Mueller museum would be a great stop to see Mueller items on display. The company is best known for its water and gas valves and manufacturing of fire hydrants, he also invented the tapping tool still used today to tap into water lines. At one time the museum offered a video on Mr. Muellers family history. Hope this helps I can send photos of vases if you like to see them. Many thanks for taking the time and trouble to write in - very much appreciated. Interesting to get your eye-witness account and confirmation we are piecing it together correctly. Yes please, I would love to post up your pics. I am in Decatur, IL now closing Mom' s estate. 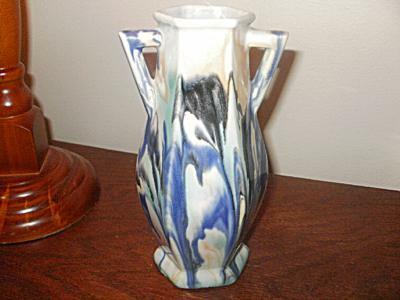 I came apron the mueller vase much like the one shown in picture. I will visit the Mueller museum next week, any new info I will pass on. This is so interesting. My dad worked there in the 1950's. Maybe that is where it came from. I also have 2 of these vases and I purchased them at an auction. I'm still looking for a value on them. Very nice small vases with unique colors. I have read all their history but just wanting to know their value now.....does anyone know that? I guess these Mueller vases are too new (not antiques yet) and a little too unknown (lacking in notoriety) and not perceived as 'quality' (they are not the luxurious wares of a prestige maker) to have any true collectible value yet, although they have do an interesting history, which is in their favour if this can be presented properly and the sale is local to where the history happened. I looked through past listings of auction results from many different US auction houses and saw only one sale listed in 2008. The estimate was $100 - $150 yet the vase sold for only $33. The description listing was terrible and made no mention of the interesting 'Americana' type history. Draw your own conclusions from this information. Thank you so much for your answer. I have had these vases for a period of time because I thought the history of them was very interesting and maybe they were something I should keep. I have decided I will sell them and will take your advice and try to give them the description and history story they deserve. I live only 50 mile from Decatur, Ill. so that is probably the reason I came up on them at an auction. I'm not sure if the links to the original listings will work. As a seller with a store subscription, I can search for an item and it will show me listed items but will also provide me with a link to view sold items. I have a liking for these vases - they are real Americana and I can see why they may become collectable. I am not surprised at the fact you got over $100 USD. You must have done a decent description which did justice to them, unlike some of the others I saw. I'm very interested in what your vase does on EBay this time. I also sell on the site and also still have two of these vases that I have not listed as of yet. Guess I thought value might increase if I held them for awhile. Will wait to see your posting. I am writing this in order to provide a bit more color to the overall picture regarding what a fair price would be for these excellent art deco Mueller vases. There is a good chance that I purchased those mentioned by the above contributor at a price above $100 using Ebay auctions. I absolutely love these particular vases and consider them to be worth much more. There are more than a dozen or so currently residing in a position of prominence where I display my collectibles. I have paid as little as $30 and more than $150 for them (not saying how much more). The Mueller Co. history researched and described above is correct. It is not my intention to detract from this excellent resource by discussing prices as I am truly a fan. That being said, I would invite any interested collector that may currently be in possession of a Mueller vase of any size to contact me at fmueller77@hotmail.com to continue the discussion of collecting and assigning a fair and accurate price for items such as these that have a direct connection to such a unique company and its contribution to the growth of our great nation. Just to say thank you for your very welcome comments. Return to 5. China Chat - American & Canadian Marks.